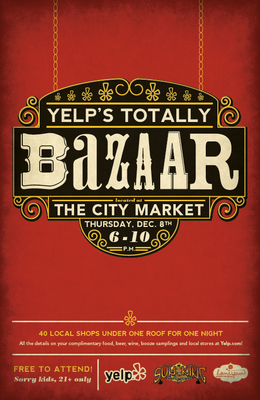 Yelp!’s Totally Bazaar tonight at Indy City Market! I feel bad that I’ve not had much of an opportunity to promote this myself, because it’s a pretty amazing event that Yelp! is putting on tonight at City Market here in downtown Indy. I’m going to be there with the Vouched table, along with dozens of other local shops/vendors, and beer, and rolly derby girls, and food, and tattoo-inspired stained glass, and beer, and seriously. Just go to the Yelp! event page and check out the list of vendors. It’s going to be insane. If you’re a Yelp! member, you can also click “I’m in!” on the event page, and you’ll be entered to win a big prize pack of local goods from local awesome people. Thanks to Jon from Yelp! for inviting me to be a part of the Bazaar, and I hope to see you there!